It was hot and dusty when we stepped out of Pochentong Airport and into our waiting host’s car. Soon we were being driven through a city that would be our home for the next two months. Gazing out of the car windows we couldn’t help but notice the contrast of Phnom Penh’s streets to a much more modern and progressive Bangkok where we had briefly stopped over on the way here. The capital of Cambodia, Phnom Penh could have easily been a rude shock for the unwary traveler during the time when we first visited. Potholed and dusty secondary streets with garbage strewn about, chaotic, sometimes dangerous traffic and theft are enough to keep any visitor on edge. But the city has plenty of other things that give it an exotic charm: temples, wats and palaces showcasing classical Angkor architecture, French colonial architecture buildings, a variety of dining options including restaurants and cafes serving European fare and a host of bargain-shopping options. And since we know from experience that cities in other parts of the globe each have their own edgy side, it was relatively easy for us to relax in Phnom Penh especially as we got to know the city and its populace more. 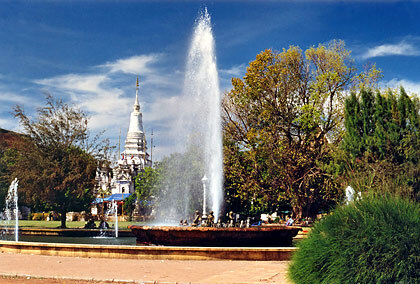 A fountain on a park near the city center with the Wat Phnom in the left background. One of the things that we kept in our minds during our first visit here was that the city – and the country – were just recovering from decades of war and the brutal reign of the Khmer Rouge. The latter was still active in its jungle enclaves up north but would practically cease to exist in little more than a year after our arrival in Phnom Penh in 1998. But even back then Phnom Penh was already a city on the rise with new buildings and businesses, many spurned on by foreign investment. It was a well laid-out city with wide boulevards and a nice riverfront that has seen several cafes and restaurants sprout up in the last few years. This was a city whose population was forcibly evacuated by the Khmer Rouge in the ‘70s and practically became a ghost town for a few years. The Throne Hall, Royal Palace. 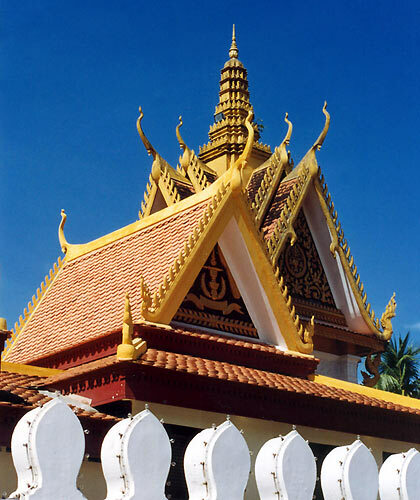 This is still in use today for religious and royal ceremonies and as a meeting place for the Cambodian king’s guests. What we enjoyed most about Phnom Penh is its rich and colorful past as preserved in its Khmer palaces and French colonial buildings. 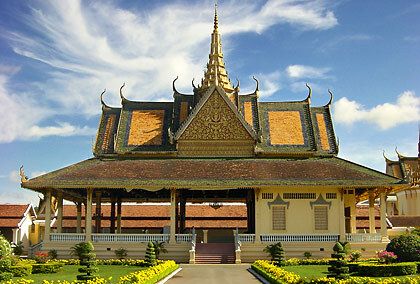 The Royal Palace, built in the 1860’s and showcasing traditional Khmer architecture, is a must-visit. It is actually a complex of buildings on the western bank of the Tonle Sap and Mekong Rivers that serves as the residence of the king of Cambodia. 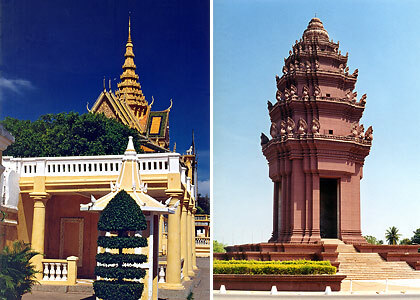 Major buildings inside the palace complex are the Throne Hall, the Silver Pagoda Compound, the Moonlight Pavilion, the Phochani Pavilion and the Khemarin Palace (the current residence of the King of Cambodia). There are stupas, towering spires, gardens and even a French-style iron building given as a gift by Napoleon III. The Phochani Pavilion, Royal Palace complex. Once dubbed a Paris of the East before 1970, Phnom Penh still contains reminders about its French colonial past. There are a few colonial buildings that managed to survive the ravages of war including Napoeon III’s iron building in the Royal Palace complex given as a gift to the country. French baguettes are served in various stalls. Dining on the banks of the Mekong and Tonle Sap has made a comeback. Most popular among tourists is the Sisowath Quay or Riverside – an attractive boulevard along the banks of the Mekong and Tonle Sap. With locals the more popular dining places are those along the Mekong just a little distance after crossing the Japanese Friendship Bridge – a place we often visited with our Cambodian friends. 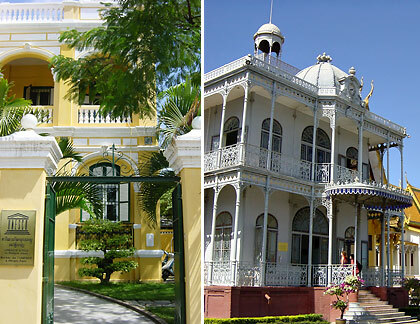 French architectural influences still remain: the UNESCO office in Phnom Penh and an iron building donated by Napoleon III at the Royal Palace grounds. One of the city’s familiar landmarks is the Independence Memorial which commemorates the country’s freedom from French rule in 1953 (see the right half of the top picture on this page). The memorial is situated in a park which is a favorite public gathering place at night when its fountains erupt in geysers of multiple colors to the tune of communal music. Atop a hill on a small park near Sisowath Quay is the Wat Phnom, a historically important structure and another popular gathering place for locals and tourists. There was an elephant at this temple site when we first visited but we haven’t heard any mention about the creature since. 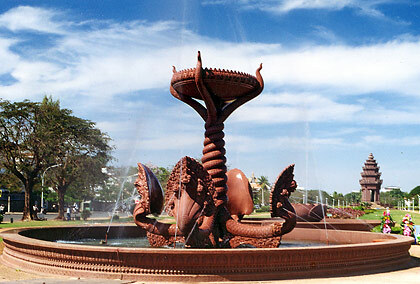 The Naga Fountain in the city center with the Independence Monument, commemorating Cambodia’s independence from the French in 1953, in the background (the Naga is a mythical five-headed snake). 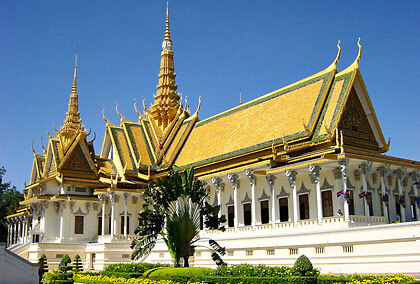 If art or history is your interest then visit the National Museum of Cambodia located near the Royal Palace. 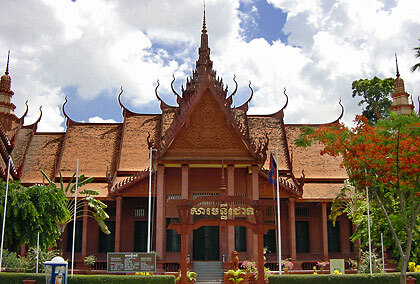 This museum has an excellent collection of Angkorian art dating back to the 12th century. A more sinister museum is the Tuol Sleng Genocide Museum, formerly the S-21 Prison where the Khmer Rouge tortured more than 14,000 people before killing all except for 8 prisoners who barely made it out alive. Visiting the school-turned prison was a depressing experience. Some of the beds where the last victims were tortured were kept in the condition invading Vietnamese troops saw them when they stormed into Phnom Penh to capture the city from the Khmer Rouge. Dried up blood still mark the floors beneath the beds while pictures on the walls of tortured victims strapped to their beds remind the visitor of the brutal reign of Pol Pot. Many more pictures of victims covered the walls of the prison alongside exhibits of various torture implements used by the Khmer Rouge. We even came across an infamous map of Cambodia made up of skulls which has since been dismantled. About 17 kilometers south of Phnom Penh is the Choeung Ek Killing Fields where remains of Khmer Rouge victims were dug up in mass graves. A Buddhist stupa marks the site; the stupa contains 8,000 human skulls seen through its glass sides. In the early part of the 21st century, several restaurants serving a wide variety of international cuisine have sprouted all over the city: French, Japanese, Korean, Indian, Chinese, Greek, Russian, Filipino, Lebanese, Singaporean, Italian, Mexican, Nepalese - you name it. Quite impressive for a city in such a developing country. Locals say that United Nations forces from different countries on peace-keeping missions in the 1990s led to the opening of these restaurants. We ended up trying four different Indian restos and a Sri Lankan restaurant and got to eat at a Greek restaurant for the first time ever – in Cambodia (!). Restaurants serving Vietnamese and Thai cuisine also abound. We did enjoy Khmer cuisine which shares many similarities with its Thai and Vietnamese counterparts. And like Vietnamese food, Khmer cuisine exhibits French influence including their iced coffee and Asian-style baguette sandwiches. 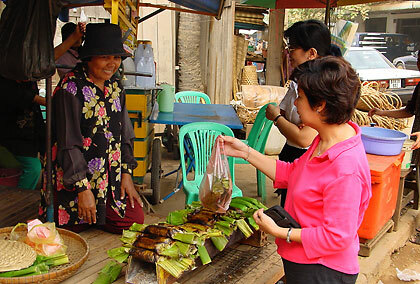 Filipino friends buying from a market stall. Because we stayed in Phnom Penh for two months Nina had to do some marketing for our everyday needs. No problem. The 1930s Art Deco covered Central Market near Sisowath Quay and a nearby Lucky Supermarket provided all that we needed for food and groceries. One can also shop at the Central Market for used clothing (including designer clothes from Europe), souvenirs and jewelry from Pailin. Real designer clothes also abound at the Russian Market (so-called because Russian advisers in the 1980s used to frequent the place) where they are sold at huge discount prices; most of the designer clothes have small, almost unnoticeable factory imperfections. If you’re looking for traditional Khmer clothing and fabrics, then the more modern, multi-story Olympic Market is the place to be. In recent years a few malls have risen in the city including the Sorya Mall and City Mall. Both are Western-style shopping malls. One of the first things we noticed about Phnom Penh was the comparatively high proportion of the local populace that could converse in English. This was probably influenced by the significant number of foreigners in the city starting with the UN peacekeeping force that arrived in the 1990s. This made it relatively easy for us to find our way around without learning Khmer during our two-month stay. Left: Motorbikes are common in Phnom Penh. Right: Driver waiting for passengers with his cyclo. To get around the city one can either rent a bike or get on a motorbike taxi. Motorbike taxis can be found practically everywhere and will take more than one passenger per ride. Taxi cars are now available (there were practically none when we first came in 1998). 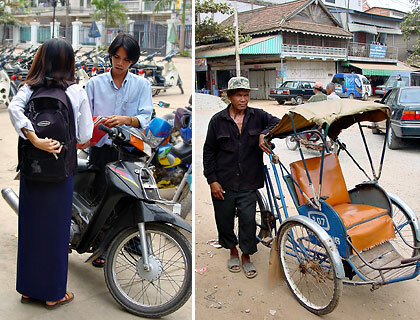 Tuk-tuks, a Southeast Asian invention, are also available featuring a motorcycle with an attached cabin for passengers. For a more traditional ride, get on a cyclo, a three-wheeled, manually powered cycle-rickshaw. The former is becoming less common but is still popular with both locals and tourists. The traffic in the city can be chaotic and there was a time during our stay when hardly a day passed by without us witnessing a traffic accident involving motorbikes. While about to cross a street Leo nearly got sideswiped by a motorbike speeding on a sidewalk in the opposite direction. Leo also got an opportunity to drive a right-hand drive car – on a road with traffic on the right side of the road. This was because many of the cars (mostly used ones) came from Thailand where cars are right-hand drive. We haven’t checked lately but at that time a law was about to be passed requiring right-hand drive cars to convert to left-hand drive. We have not visited Phnom Penh for quite some time now and are sure that the city would look very different from how we saw it more than ten years ago. The peace the country now enjoys has surely contributed much to its growth. But we are also sure that much of the city’s exotic charm is still there, a charm that has not been tarnished by decades of war.